Tank mix compatibility agent eliminates problems with mixing fertilizer solutions or suspension fertilizers with emulsifiable concentrates and flowable pesticides. Increases tank mix partner options in water or nitrogen carriers. Corrects "cottage cheese" incompatibilities . Lowers spray solution pH to prevent alkaline hydrolysis . Ideal for Prowl tank mixes in liquid fertilizer solutions. Use 1–4 pints of Convert per 100 gallons of spray solution to prevent antagonistic tank mixing conditions. 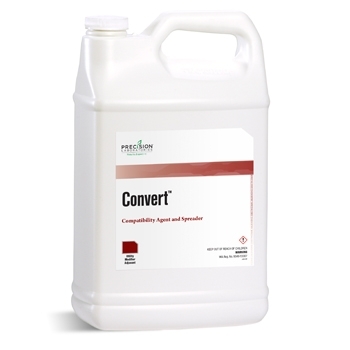 Use 3–6 pints of Convert per 100 gallons of spray solution to correct tank mix incompatibilities.